I've been reading a lot lately...This week's book recommendation is Teaching with Poverty in Mind: What Being Poor Does to Kids' Brains and What Schools Can Do About it by Eric Jensen. So often we as teachers can get wrapped up in the day-to-day of curriculum and assessment. Sometimes we can overlook that what happens in the students' home lives--and, in fact, what has happened for their entire lives--plays an enormous role in not only their ability to accomplish the tasks we give them but also in their ability to function in class and process information and emotions. This book serves as an excellent reminder in both theory and practice. One of the most interesting concepts to me was the chapter on emotional challenges, stressors, cognitive lags, and health and safety issues and their effects on academics. 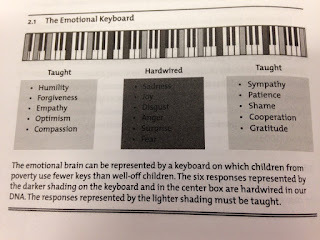 Jensen covers the how and why of these effects, but he then offers specific action steps for individual classroom teachers and whole schools. 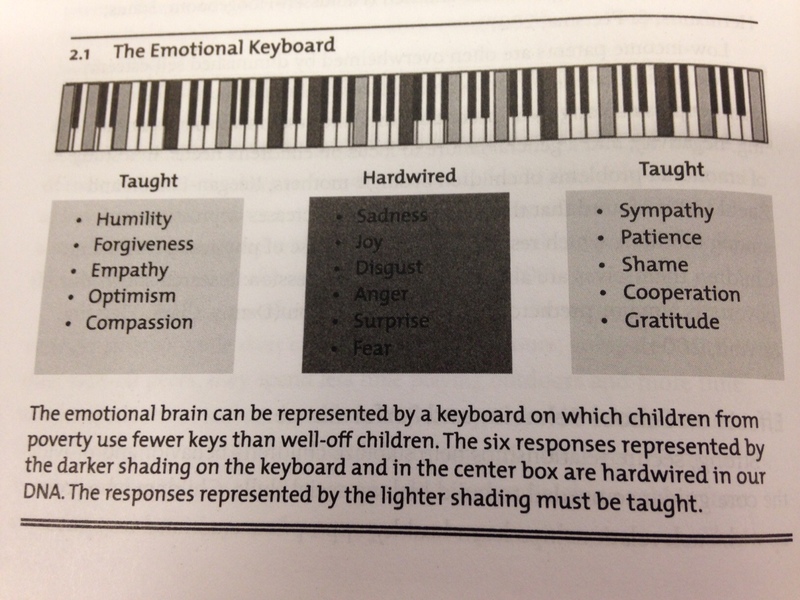 This includes the graphic below that highlights the idea that while most people are "hardwired" for certain emotions, other emotions like those on either end of the "emotional keyboard" are ones that need to be taught--in this case, at times, by teachers. This is partnered with the importance of a mindset of change, a concept also echoed in Mindset by Carol Dweck. Finally, Jensen closes with a chapter on schoolwide success factors and a chapter on classroom success factors. At a schoolwide level, he suggests focusing on Support of the Whole Child, Hard Data, Accountability, Relationship Building, and an Enrichment Mindset. At the classroom level, he focuses on Standards-Based Curriculum and Instruction, Hope Building, Arts/Athletics/Advanced Placement, Retooling of the Operating System, and Engaging Instruction. He goes into great detail on each of these factors, including suggestions for avoiding common mistakes. What makes this book so accessible to administrators and teachers alike is not only Jensen's approachable explanations of theories but also the tangible and manageable set of factors for helping to guide entire schools in better teaching students in poverty.